The 2011 WTF World Taekwondo Championships kick off on May 1, 2011 for a six-day run in Gyeongju, Korea, drawing about 1,700 athletes and officials from a record 149 countries. 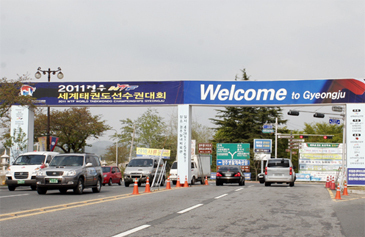 The WTF World Taekwondo Championship kicks off on May 1, 2011 for a six-day run in Gyeongju, Korea on May 1-6, 2011. The biennial championship, which will take place at the Gyeongju Indoor Gymnasium, is expected to draw about 1,700 athletes and officials from a record 149 countries. 1,040 athletes and 715 officials submitted their entry forms to the WTF. New Caledonia, which became a full member of the WTF in 2010, is sending for the first time one male athlete and two officials to the Gyeongju championship. The previous WTF World Taekwondo Championship was held in Copenhagen, Denmark in October 2009, and attracted 928 athletes from 142 countries, compared with 865 athletes from 116 countries at the 2007 Beijing World Taekwondo Championship. It marks the sixth time that the championships will be held in Korea, where taekwondo originated, with the latest championship held in Jeju in 2001. Reflecting the importance of the championship, Korea’s KBS TV, the host broadcaster of the event, will broadcast live all the semifinal and final matches. Such broadcasters as PC TV Mexico, Globosat Brazil, ESPN 360 USA, CCTVB China, RAI Italy and NTV Russia will also broadcast the competitions live. News feed will be produced and distributed worldwide on every competition day, while highlight feed will also be produced and distributed worldwide four days after the end of the competition. The championship, which will feature 8 male and 8 female weight categories, will use a protector and scoring system (PSS), formerly known as electronic body protectors, and an instant video replay system, for fairer judging. For the first time in the World Championship, an athlete will earn four points if he or she delivers an effective turning kick to the opponent’s head. A 12-point gap victory system will apply to the upcoming championships. The semifinal and final matches of the women’s -49kg and men’s -58kg weight categories are scheduled to take place at the center court from 2 p.m. to 4 p.m. on May 2, and those of the women’s -53kg, the women’s -67kg and the men’s -80kg from 2 p.m. to 4:30 p.m. on May 3. The semifinal and final matches of the women’s -62kg, the women’s -57kg and the men’s -68kg will take place from 2 p.m. to 4:30 p.m. on May 4, and those of the women’s -46kg, the men’s -54kg and the men’s -74kg at the same time on May 5. Those of the women’s -73kg, the men’s -63kg, the men’s -87kg, the women’s +73kg and the men’s +87kg from 2:45 p.m. to 4 p.m. on May 6. A total of 80 international referees will officiate at the Gyeongju championships. Among them are the 60 referees who were selected from among participants in three WTF-organized international referee selection and training camps for the taekwondo competition of the 2012 London Olympic Games. 25 percent of the registered athletes per weight division will be seeded based on the WTF World Ranking as of April 1, 2011. Under the theme “The Realization of Olympism through Taekwondo Education,” the championships will also feature a two-day International Symposium for Taekwondo Studies on April 29-30. The third edition of the international symposium is expected to draw about 200 academics and dignitaries from about 20 countries. During the opening ceremony of the championship on May 1, a five-member team competition between Korea and Russia with a new competition format will be held as a special event to show the world the action-packed taekwondo. The contest time will be a five-minute first half and another five-minute second half with a one-minute break. The weight divisions of the athletes are the men’s -68kg and -74kg weight categories. In the first half, a contestant shall compete with his counterpart for one minute in accordance with the submitted fight list. In the second half, athletes may be freely replaced at any time without limit after an athlete carries out at least two exchanges of techniques. On April 30, the WTF General Assembly will take place at 2 p.m. at the Hyundai Hotel in Gyeongju, in which the participants are likely to approve five countries as new members of the WTF. The five are Cook Islands, Rwanda, Tuvalu, Guadalupe and Martinique. The approval would increase the WTF global membership to 197, the seventh largest International Sport Federation. In line with the WTF’s 2011 slogan “World Peace through Taekwondo,” the participants in the General Assembly will hear four special presentations on taekwondo programs for orphans and those with disabilities. The presenters will be from Thailand, Guatemala, the United States and Canada. 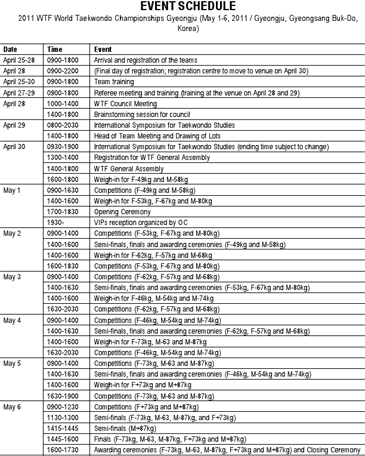 Schedule for World Taekwondo Championships.Click to enlarge.